*This memo was originally drafted as a part of the Refugees and Migration Movements in the Middle East workshop organized in collaboration with POMEPS and the Center for Middle East Studies at USC and held at University of Southern California on February 2-3, 2017. POMEPS Studies 25 is a collection of their memos from this workshop, available as an open-access PDF here. Refugees are often seen as among the world’s most marginalized and powerless groups. They typically face profound challenges to securing their basic livelihoods and live in states of precarious legal and political limbo, unclear of their rights and unable to formally influence the policies that affect them. Moreover, the conditions of their dispossession generally render them unable to engage in the types of informal political practices that less powerful groups often use to address collective grievances – things like protests, strikes, boycotts, and petitions. For refugees, the structural barriers to mobilization are usually prohibitively high. But occasionally refugees manage to overcome these barriers, confounding expectations that they will remain passive and quiescent. In this project I compare mobilization patterns among Syrian refugees living in camps in Jordan, Lebanon, and Turkey in order to make sense of a surprising empirical puzzle. While in Lebanon and Turkey Syrian refugees have staged very few protests, more or less confirming what conventional wisdom and much academic scholarship predicts about refugee mobilization, in Jordan’s Za’atari Camp refugee contention has been frequent and tenacious. What explains this striking variation in patterns of contention across these three countries? How have Za’atari’s refugee communities managed to defy expectations about refugee mobilization? And what have been the effects of these protests on the camp’s structures of governance and patterns of social life? The mobilization in Za’atari, I argue, was made possible by a unique configuration of space and governance that was absent in Turkey and Lebanon. Specifically, the refugees in Za’atari 1) were concentrated together in large numbers in a confined spatial area and 2) were governed by a poorly coordinated coalition of humanitarian and governmental organizations. These factors gave refugees the capacity to form their own leadership networks and stage protests against camp authorities. And though at first the heightened levels of contention in Za’atari created a chaotic and tense environment, over time the persistent protesting began to yield tangible results: governance structures were redesigned, aid distribution patterns changed, and camp policies were reformed. Indeed, the paradox of the early unrest in Za’atari is that it has produced perhaps one of the most livable places in the Middle East for Syrian refugees. The research for the project is based on three months of fieldwork in summer 2015, in which I visited refugee camps in all three countries and interviewed 87 individuals, including members of refugee communities, aid agencies, government authorities, and representatives of international organizations. I focused on refugees in camps because camps provide a relatively comparable unit of analysis; they are a similar spatial unit of settlement (though, as I will discuss, there are important differences between informal and formal camps) and camp-based refugees across the three countries tend to come from similar socio-economic backgrounds. I also analyze two datasets of refugee protest events, one from the Za’atari Camp (collected by UNHCR, the UN refugee agency) and one from Lebanon (web-scraped by the Lebanese data consultancy Eqlim). The Za’atari Camp was opened on July 28, 2012, when the Jordanian government made a unilateral decision to begin settling refugees on a patch of empty land in the north of country enclosed by a ditch. The population of the camp grew rapidly, eventually reaching 130,000, and the myriad organizations in charge of the camp found it increasingly difficult to manage. Initially Za’atari was run by the Jordanian Hashemite Charity Organization (JHCO), a pseudo-governmental aid organization with little experience in running refugee camps. It frequently clashed with its UN and international NGO (INGO) partners, who had been tasked with providing specific aid and services. The UN organizations and INGOs took what one UN officer described as an “infrastructural” approach to aid delivery, with a focus on “setting up the apparatuses of service provision,” like facilities, logistics, and orderly processes. In contrast, JHCO preferred to distribute aid more quickly and directly. In general during the camp’s first six months these humanitarian organizations remained in their base camp on the northern perimeter, distributing goods from the main gate. Meanwhile, security was provided by two branches of the Jordanian military that had no experience with policing; they too remained stationed at the periphery of the camp, only entering when there was unrest, which they typically quelled with teargas. With such a fragmented and removed camp administration, it was not long before leaders within the refugee community began to emerge and establish an informal system of governance. In some cases these leaders had been authority figures in Syria– they were the heads of large families or leaders of villages or clans. But in other cases they built up their power in the camp itself, often by running small businesses or smuggling operations, which allowed them to accumulate resources and access to goods. Within three months of the camp’s opening these leaders had worked out their own informal system of governance, with each leader overseeing a particular street (giving them the informal name “street leaders”). Above a group of street leaders would sit a district leader, who might have influence among thousands of camp residents. Within their respective regions of authority, street leaders served both as resource brokers and as arbiters of communal disputes. In parallel with the rise of these informal leaders, Za’atari experienced a marked escalation in contentious events – including protesting, demonstrating, rioting, stone throwing, blocking roads, forcing entry, and occupying buildings. Interviews with camp residents and authorities, as well a review of the meeting minutes at the weekly Camp Management Committee meeting for 2013 and 2014, suggests that these incidents were mostly driven by refugee grievances related to services (like electricity provision, water distribution, or food quality) or by security issues (like regulations regarding entering and leaving the camp). Typically they targeted either the humanitarian organization responsible for providing the relevant service or good, or the Jordanian security forces in charge of policing the camp. Though some of these outburst were spontaneous, interviewees and camp governance reports indicated that much of the contention was organized by street leaders, who used their resources and influence to motivate their followers to make claims against camp authorities, and worked together to protect each other from crackdowns by security forces. 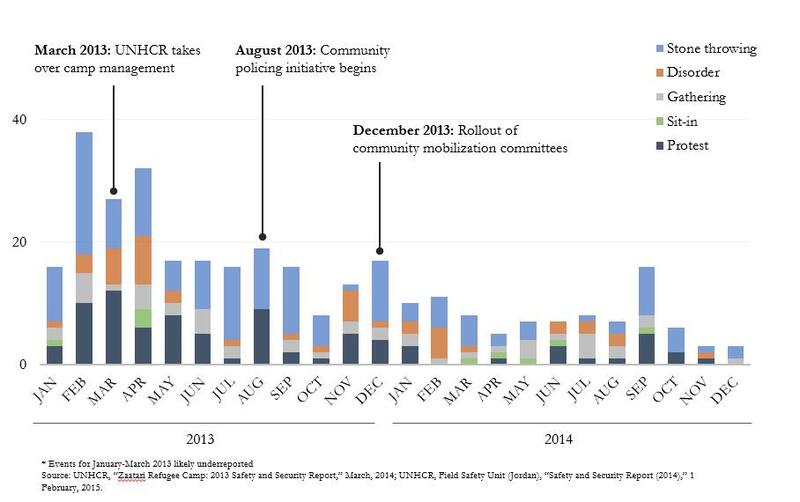 Figure 1 charts the contention in the camp from January 2013 to December 2014. Though the data are partial (2012 data were not collected, and data for January through March 2013 are underreported) they point to the high levels of refugee mobilization during the camp’s early days. 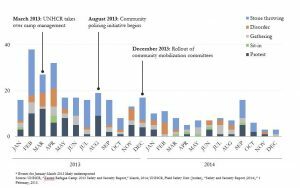 Though the data are partial (2012 data were not collected, and data for January through March 2013 are underreported) they point to the high levels of refugee contention during the camp’s early days. In part due to these high levels of unrest, the Jordanians decided to hand centralized management responsibilities of the camp over to UNHCR in March 2013. The new camp director, Kilian Kleinschmidt, chaired his first Camp Management Coordination meeting on March 19, 2013. At this gathering he had the following stern words for his Jordanian and international partners about the need to improve their levels of coordination: “We need to work together, in a spirit of teamwork and partnership, with UNHCR coordinating… It’s important that we have clarity of organization and responsibilities. In principle, all the UNHCR people working in Zaatari report to [me].” One of the primary “action items” listed in these minutes was to “send [the] contact list for street leaders,” so that Kleinschmidt could meet with them later the same week. Over the course of the next nine months, UNHCR administrators restructured their approach to camp governance, with a strong emphasis on engaging and incorporating the informal leaders who had come to control the camp. Kilian Kleinschmidt began holding regular meetings with street leaders to discuss community grievances; this eventually became the primary forum in which differences between refugees and camp management were negotiated and worked out. In August 2013, a new community police force, trained in community outreach and conflict mediation, began replacing the heavy-handed military troops. Several months later UNHCR and its partners launched a community mobilization program, designed to improve outreach to refugee communities through issue-specific committees. Service provision practices were eventually restructured to better accommodate refugee demands. For example, camp administrators eventually allowed refugees to have their own private bathrooms and water tanks, rather than use the communal facilities that had first been set up, and they built grocery stores, where refugees could select their own food. At the same time that these changes were being implemented, contention in the camp began to decrease (see Figure 1). The new patterns of interaction between street leaders and camp managers established formal communication channels that hadn’t existed before and many of the most pressing refugee grievances were addressed. Under these new terms, leaders had far fewer reasons to organize protests; they maintained their authority and became UNHCR’s de facto partners in camp governance. The refugee management system established to manage the 1.1 million Syrians who have fled to Lebanon has differed from Jordan’s system in several important respects. If anything, aid provision has been even more uncoordinated than it ever was in Za’atari, with a patchwork of Lebanese government agencies and local and international NGOs responsible for different regions and sectors. But perhaps most important for shaping the organizational capacities of refugee communities has been the Lebanese government’s insistence that no large or formal refugee camps be established. Instead, many Syrian refugees in Lebanon have set up small informal settlements on vacant strips of land in rural parts of the country. These settlements are usually quite small (less than 1,000 people) and often several kilometers removed from each other. They are also highly vulnerable to attack and harassment from local police or host populations. Though residents can technically come and go as they please, most residents rarely leave the settlements due to security concerns (Lebanon has myriad checkpoints, and refugees without the proper papers can be arrested and detained). There are few social networks or relationships between residents in different settlements. Usually in each camp one resident will come to serve as an informal leader and interlocutor with aid organizations. But unlike the street leaders in Za’atari, these informal leaders have not formed their own dense and hierarchical leadership networks; the small size, isolation, and vulnerability of the settlements they live in has proven to be an insurmountable obstacle to building such informal structures. Without these structures they have not been able to mobilize the types of broad followings nor provide the same type of mutual support and protection that facilitated the resistance to Za’atari’s humanitarian authorities. Although data comparable to the UNHCR event data in Za’atari is not available in Lebanon, the Lebanese consultancy Eqlim has scraped publicly available Internet content to produce a database of geocoded contentious events involving Syrian refugees from 2014 and 2016. These data were supplemented by event data from Lebanon Support’s Conflict Map of conflict-related incidents in Lebanon from June 2014 to January 2017. Over this three-year period there have been only 18 incidences of contention in 13 locations across Lebanon. We may also learn something from the pattern of where these small numbers of events occurred. Figure 2 maps the location of protests against the location of refugee settlements of over 100 residents. It suggests that protesting by Syrian refugees has tended to emerge in locations that more closely approximate Za’atari’s conditions – i.e., places where greater numbers of refugees are concentrated together and where governance is weaker. 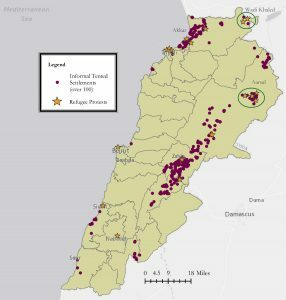 For example, we can see that the most protests emerged in places like Aarsal, Akkar, and Wadi Khaled, where large settlements tend to be clustered close together and both Lebanese and humanitarian authorities have had a limited presence. Finally, Turkey’s regime of refugee governance can be contrasted to both Jordan’s and Lebanon’s in the high level of managerial competence that it has exhibited, particularly in the 25 refugee camps that it has set up in the south of the country, which house roughly 200,000 refugees. From the outset of the crisis the Turkish government refused offers of assistance from the UN and INGOs. The camps were run instead by a government agency, the Disaster and Emergency Management Presidency (AFAD), with close ties to the central government and significant human and capital resources. This agency established a well-coordinated apparatus of governance in each camp, with one camp director and two vice directors in charge, and a small number of service and security organizations to support. The security presence in the camps was far higher than it had been in Za’atari – for example, in camps of several thousand refugees the Turkish authorities dedicated roughly one hundred security forces, the same number that Za’atari had in early 2013 to manage 100,000 residents. The governance system established by AFAD allowed it to closely monitor life in its camps, and social space was never ceded to Syrians in the same way that it was in Za’atari. As a result, refugee contention in Turkish camps, like in Lebanon, has been quite minimal. The tight monitoring of life in these camps has prevented autonomous refugee groups from emerging, in turn limiting the ability of refugees to make demands against authorities. On the few occasions when unrest has emerged, the Turkish security forces have cracked down swiftly, often evicting those involved from the camps (or from Turkey entirely). Though AFAD has designated refugee leaders in each camp district to distribute information and source grievances from their neighbors, these leaders owe their positions to the camp authorities and therefore serve more as tools of demobilization than has agents of refugee mobilization. The contrasting patterns of contention in camps in Jordan, Lebanon, and Turkey point to some important lessons regarding the conditions under which we are most likely to see mobilization and political organizing among refugees. The concentration of large number of refugees in the Za’atari Camp, combined with the fragmented and uncoordinated administration that first governed it, provided refugees with the space to develop their own autonomous leaders and informal social networks. These informal leadership networks provided a basis for sustained mobilization through the camp’s first year. In Lebanon, the isolation and vulnerability of the informal settlements prevented comparable leadership networks from forming. And in Turkey the well-consolidated system of authority in the camps forestalled the emergence of autonomous, powerful leaders. As a result, Lebanon and Turkey have seen far fewer protests among refugees than Za’atari did. And though the Za’atari protests created chaos and instability at the time, ultimately they brought about a pattern of governance and welfare provision far more responsive and inclusive than those that have emerged elsewhere in the Middle East. Killian Clarke is a PhD candidate in comparative politics at Princeton University. Author interview, humanitarian affairs advisor, UN organization, Amman, Jordan, 18 August 2015. The organizations frequently undermined each other in methods of aid distribution. For example, on one occasion during the winter a UN organization received a donation of caravans but decided not to distribute them directly to the refugees. JHCO, noting that it was cold, urged the refugees to take the caravans for themselves. Author interview, former employee, Jordanian Hashemite Charity Organization, Za’atari, Jordan, 25 August 2015. Author interview, team members of private security consultant, Amman, Jordan, 20 August 2015; author interview, former employee, Jordanian Hashemite Charity Organization, Za’atari, Jordan, 25 August 2015; author interview, local officer, UN organization, Za’atari, Jordan, 23 August 2015. Author interview, street leader 1, Za’atari, Jordan, 25 August 2015; author interview, former district leader, Za’atari, Jordan, 25 August 2015; author interview, Women’s Committee of Za’atari residents, Za’atari, Jordan, 19 August, 2015; author interview, community service officer, UN organization, Za’atari, Jordan, 24 August 2015; author interview, Za’atari camp director, UN organization, Skype, 24 January 2016. “CCCM meeting in Za’atri” Draft minutes,” Tuesday 19th March, 14:00 hrs, p.1. Author interview, community mobilization officer, INGO, Za’atari, Jordan; Author interview, street leader 2, Za’atari, Jordan, 25 August 2015; author interview, community service officer, UN organization, Za’atari, Jordan, 24 August 2015. Author interview, team members of private security consultant, Amman, Jordan, 20 August 2015. Author interview, community mobilization officer, INGO, Za’atari, Jordan; author interview, community service officer, UN organization, Za’atari, Jordan, 24 August 2015; author interview, community outreach volunteer, international organization, Za’atari, Jordan, 19 August 2015; author interview, Za’atari Camp coordinator, INGO, Za’atar, Jordan, 24 August 2015. Author interview, team members of private security consultant, Amman, Jordan, 20 August 2015; author interview, Za’atari camp director, UN organization, Skype, 24 January 2016. Author interview, humanitarian affairs officer, UN organization, Beirut, Lebanon, 11 August 2015; author interview, founder, Syrian NGO, Beirut, Lebanon, 3 August 2015; author interview, coordinator, education sector working group, Beirut, Lebanon, 28 July 2015; author interview, founder, Lebanese NGO, Beirut, Lebanon, 22 August 2015; author interview, field coordinator, INGO, Beirut, Lebanon, 23 July 2015. For a good summary of the debate over camps in Lebanon, and the motivations for preventing their construction, see: International Crisis Group, “Too Close for Comfort: Syrians in Lebanon,” Middle East Report no. 141, 13 May 2013, p. 16-18. Author interview, informal camp resident, Beka’a, Lebanon, 31 July 2015; author interview, principal, informal camp school, Beka’a, Lebanon, 31 July 2015; author interview, director, local NGO, Beka’a, Lebanon, 31 July 2015; author interview, volunteer, Syrian NGO, Beka’a, Lebanon, 4 August 2015. These leaders are typically referred to as shawish and are the closest analogy to the informal leaders in Za’atari. They are typically tribal leaders or the heads of large families, and are often also empowered by aid organizations that use them to distribute food, tents, and other goods to a settlement. Author interview, field coordinator, INGO, Beirut, Lebanon, 23 July 2015; Author interview, head of educational development, local NGO, Beirut, Lebanon, 31 July, 2015; Author interview, founder, Syrian volunteer group, Beirut, Lebanon, 3 August 2015. 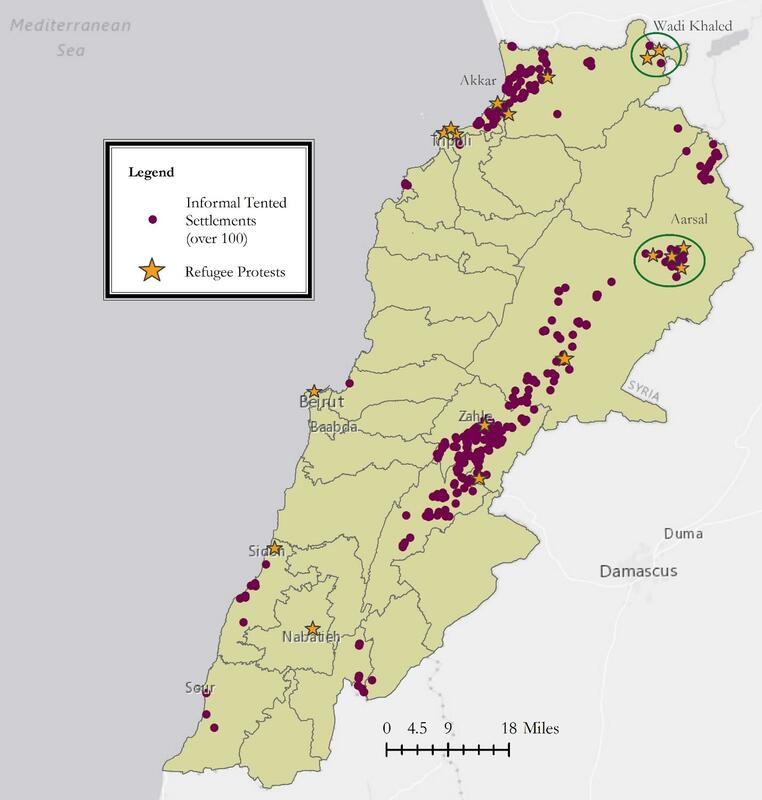 For more on the role of shawish see: Muzna al-Masri, “Between Local Patronage Relationships and Securitization: The Conflict Context in the Bekaa Region,” Lebanon Support, January 2015. These quantitative measures were confirmed by interviewees, who noted that protesting by Syrian refugees in Lebanon is exceedingly rare. Aarsal was the zone with the most protests (three total) over this three-year period. In 2015 Aarsal also had the greatest number of Syrian settlements (91 settlements) and the highest population of refugees living in settlements (20,000+). Moreover, Aarsal is isolated and remote, and for a long time it was inaccessible to humanitarian NGOs. Author interview, field officer, UN organization, Kilis, Turkey, 15 June 2015; Author interview, head of education programming, UN organization, Antakya, Turkey, 15 June 2015. Author interview, former coordinator of Hatay camps, Yayladagi, Turkey, 12 June 2015. Author field visit, Kilis Container City, Nizip Tent City, and Nizip Container City, 15 June 2015. Author interview, former coordinator of Hatay camps, Yayladagi, Turkey, 12 June 2015; UNHCR, “Zaatari Refugee Camp: 2013 Safety and Security Report,” p. 15. Author interview, education programming coordinator, UN organization, Antakya, Turkey, 11 June 2015. Though protest data analogous to the UNHCR incident data in Za’atari or the Eqlim’s web-scraped data for Lebanon is not available for Turkey, the lack of mobilization in the Turkish camps was confirmed both by interviewees and third party researchers. Moreover, a review of Turkish national and local news sources over the three year period from summer 2011 (when the first camp was opened) to 2014 identified only 8 reported instances of Syrian protests or unrest. According to a representative of the Kaymakan’s office in Yayladagi, who used to serve as the Hatay governor’s coordinator for the five camps in the governorate, the Turkish authorities had a practice of “exiling troublemakers” who were responsible for unrest. Author interview, former camp coordinator, Hatay governor’s office, Yayladagi, Turkey, 12 June 2015. This practice was also documented by journalists following one of the biggest protests in a Turkish camp, in March 2013. See: Kadir Celikcan, “Syrian Refugees Clash with Police in Turkish Camp,” Reuters, 27 March 2013; Hasan Kırmızıtaş, “600 Suriyeli sınır dışı edildi!” Dogan Haber Ajansi, 28 March, 2013. Author interview, group manager, AFAD, Skype, 14 September 2015; author interview, resident of Nizip Tent City, Nizip, Turkey, 15 June 2015; author interview, community service volunteer, UN organization, Kilis, Turkey, 15 June 2015. Another explanation for the unusual pattern in Za’atari is that the camp was dominated by refugees from Dera’a. It is possible that something unique about Syrians from Dera’a – either a stronger tendency to protest or more resilient communal structures – explains these refugees’ contentiousness. But the explanation is not born out by sub-national protect variation in Jordan. First refugees in districts without significant numbers of Dera’awis developed the same system of street leaders and exhibited the same levels of protest. And another camp, Azraq, build in 2014 (but with authority dynamics more similar to a Turkish camp) had a similarly large proportion of Dera’awis and experienced very limited contention.